Summer Sun Award | Oh, the Places We See . . . Some of the sunniest things that happen in the blogosphere is that you get to meet creative, interesting people. Like Anne who writes Tales Along the Way. Anne has been living in India for six months and now writes about her experiences. But look for a variety of posts on other topics, too, on her blog. I’ve enjoyed reading her posts, especially since we visited Nepal and India only one year ago. Her greeting/closing of Namaste brings back so many fond memories. Anne has nominated our blog for the Summer Sun Award, and to thank her, we’ll follow her lead by answering questions and nominating others. You can visit Anne at http://talesalongtheway.com. 1. 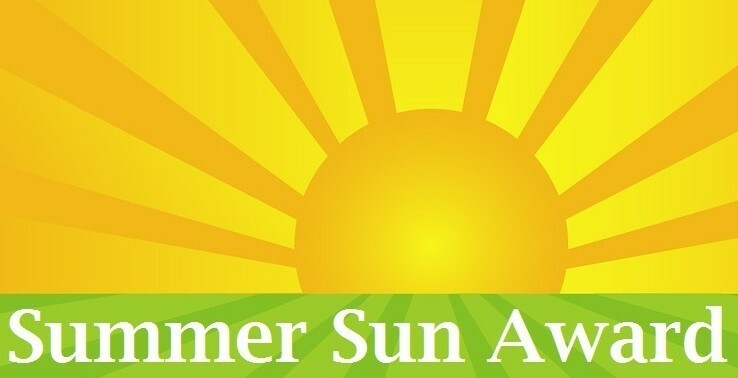 Display the Summer Sun Award medallion and link back to the blog from the person who nominated you. 3. Nominate a further lucky eight recipients (one for each ray of sun). 8. What hottie would I want to share the summer with: My husband, of course! May the end of summer bring you great memories and a forward look to a beautiful fall! This entry was posted in Awards, Travel and tagged China, Daniel James Brown, Khaled Hosseini, M. L. Stedman, Pat Conroy, Pawleys Island, Prince of Tides, South Carolina, Summer Sun Award, The Lovin' Spoonful, Tracy Chevalier. Bookmark the permalink. Thanks for the comment and for reading my blog! I’m enjoying both the traveling and the writing. But I really need readers like you to make me keep going. Thanks for taking the time to join me!